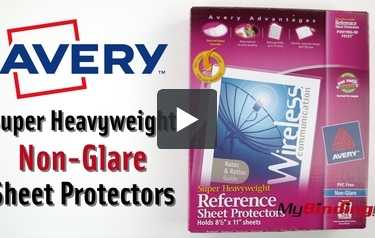 When you need truly excellent protection of your papers, depend on these Avery Super Heavyweight Sheet Protectors. They are super convenient, storing up to 10 sheets of 8-1/2" x 11" paper in each page. The Avery Easy Load feature delivers a wider top opening, allowing you to slide pages into place quickly and easily. Non-Glare material reduces distracting glare and is acid free and archival safe to keep print on your papers where it belongs, rather than sticking to the plastic. With these dependable sheet protectors, your work will be strong and solid.